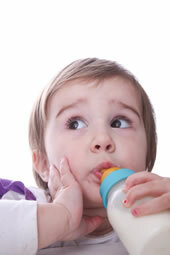 The problem is usually caused by a baby falling asleep while nursing a bottle or while breast feeding. While the child is asleep, the sugary liquid pools around the front teeth. The bacteria living in every babys mouth then turns the sugars to acid which causes decay. Dr. Dunn or Dr. Bowling can provide you with more information which can improve the care of your childs teeth and maximize their oral health.